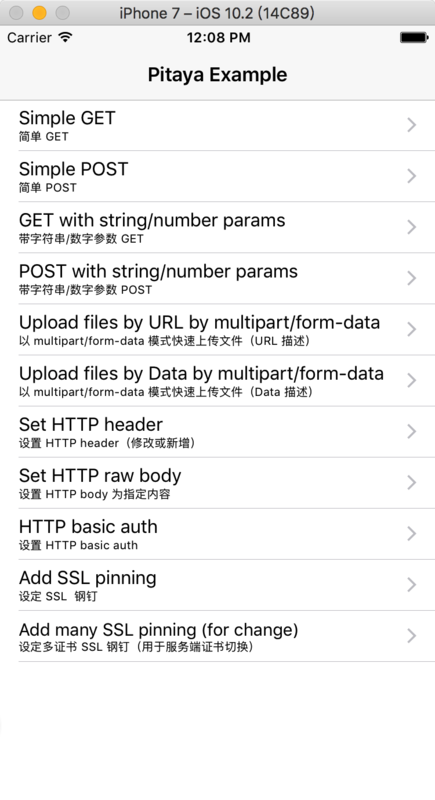 Pitaya is a Swift HTTP / HTTPS networking library for people. Inspired by Alamofire and JustHTTP. print(json["args"]["hello"].stringValue) // get "Hello Pitaya!" Xcode 9 (Swift 4) (v3.x) in current swift4 branch. Xcode 8 (Swift 3) (v2.x) in swift3 branch. Xcode 7 (Swift 2) (v1.x) in master branch. At last, add it to "Embedded Binaries" in the general panel use the "Add Other..." button. The Pitaya.framework binary file is lying in ./Carthage/Build/iOS directory. then drag Pitaya.xcodeproj into your Project, that's it! If you want to run your project on devices with Pitaya, just go to PROJECT->TARGETS->[your project name]->General->Embedded Binaries, click ＋, select Pitaya.frameWork and click "Add". Clone all files in the Source directory into your project. Pitaya is open-sourced software licensed under the MIT license.